Magento 2 One Step Checkout Extension (or Magento 2 One Page Checkout extension) displays all information in only one page, which helps customers to checkout quickly. This fast checkout extension in Magento 2 also reduces abandoned cart rates effectively. If you want to get a nice and detailed checkout success page with much more information, let's explore Magento 2 Checkout Success Page! 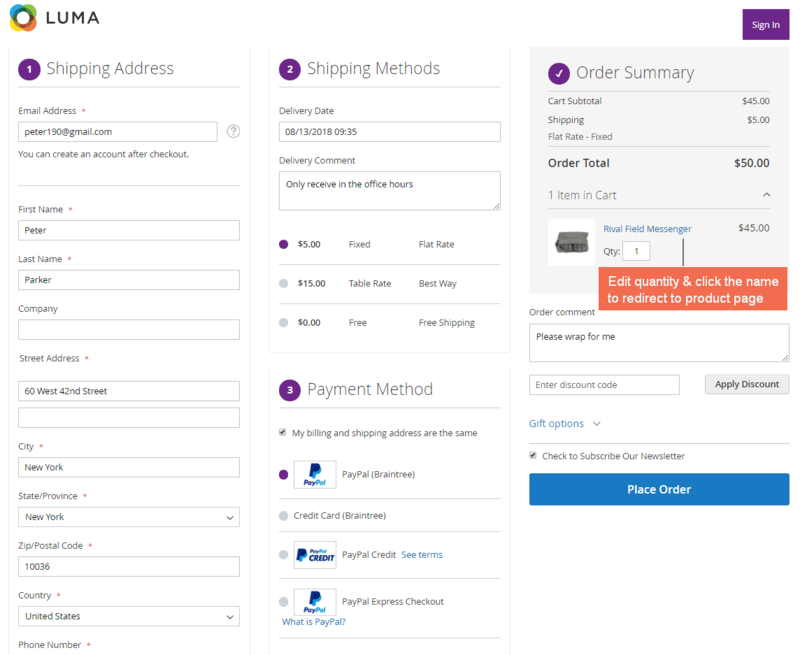 In addition, in case you want to improve customer checkout experience with shipping and payment methods, you can install this FREE extension along with our Magento 2 One Step Checkout: Pre-select Shipping/Payment. Based on customer Ip address, countries are detected and also automatically pre-filled when they go to the Magento 2 checkout page. Only by one step, this will make them easier and faster with this Magento 2 checkout extension. 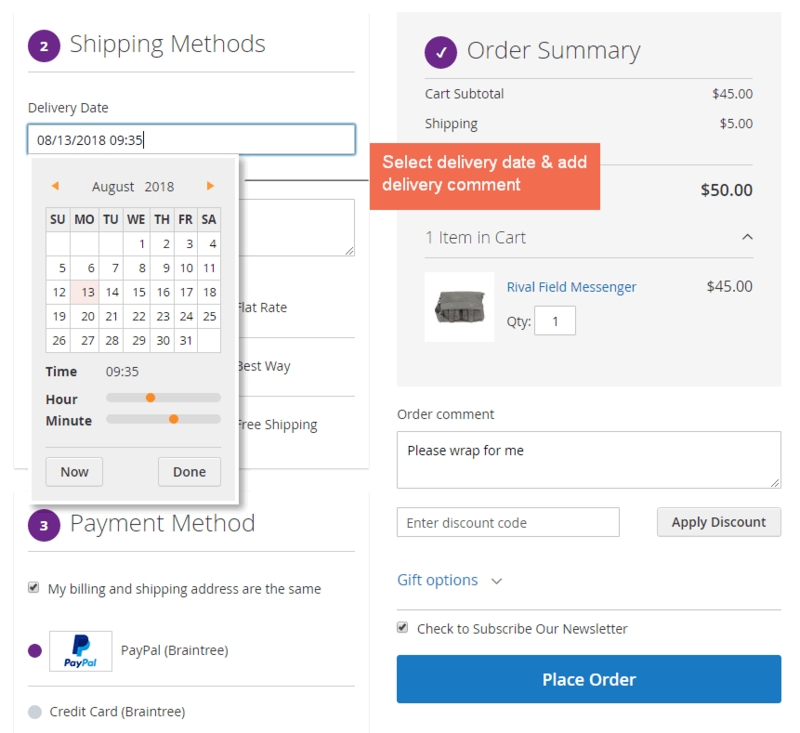 Magento 2 One Step Checkout Extension adds a delivery date section in the checkout page, which helps customers to determine when they want their orders to be delivered. In addition, they can leave more delivery comments on this page in case they have more remarks or notes to notify store owners. This function is also found in Magento 2 Order Delivery Date and Time extension with more advanced features that are useful for both customers and store owners. + In case customers purchase downloadable items, they don't need to fill in their shipping address in the Magento 2 checkout page. + This Magento One Page Checkout extension works well with Magento 2 Order Delivery Date extension, Magento 2 Checkout Success Page extension, Store Credit and Magento 2 Pre-Select Shipping/Payment extension. By installing Magento 2 One Step Checkout Extension, customers can save much time and effort to finish purchasing a product on the site because they do not have to fill in many complicated steps as in default, but all elements are completed in one page of Magento 2 by one step checkout. Customers now just put all necessary information such as Shipping address, Shipping Method and Payment Methods on only one page. Therefore, it can improve shopping experience and enhances satisfaction of customers with the simpler and easier checkout process ever. All things happen by one step. If your Magento 2 website has a complicated checkout process with much information to fill, customers often feel uncomfortable and have possibility to leave their shopping cart without finishing payment. Therefore, a quick and easy checkout is very essential to keep customers stay and continue their checking out. Magento 2 One Step Checkout Extension is really a useful tool to bring the best shopping experience for customers by providing a complete checkout process without complexion, which results in the higher conversion rate for stores. Extension Onepage Checkout is superb! Extension Onepage Checkout is superb, i installed it in 3 minutes on Magento 2.2.5 and it is the best one page checkout i ever used. Highly recommended! 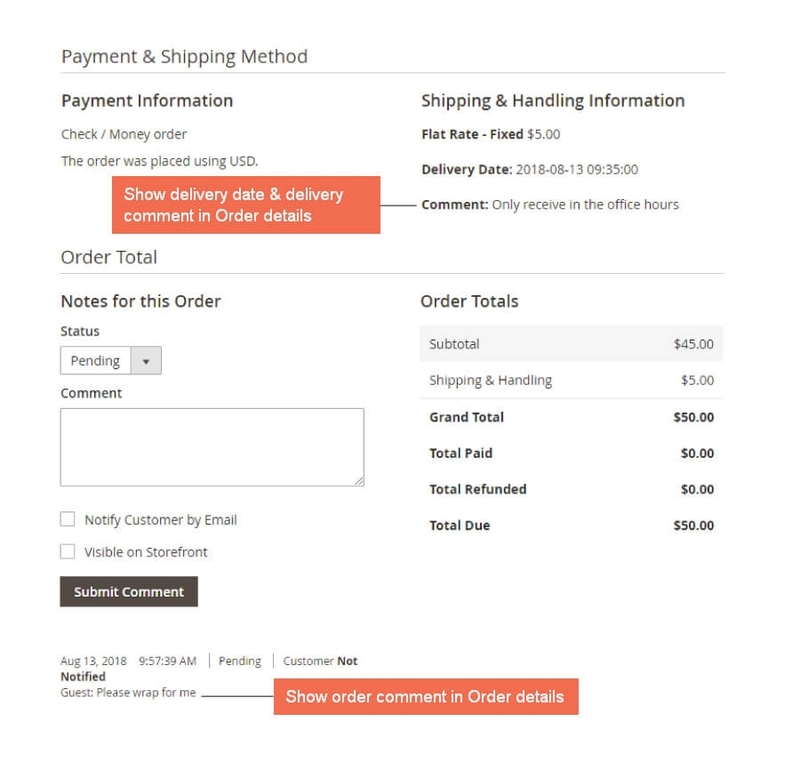 We have been looking for a One Step Checkout component for quite some time, but we had specific requirements around ease of use and neat layout. We have analysed about 8 different extensions, and this was the one with the best layout, and a very fresh, responsive look & feel. Given that the price is also the most competitive we have seen, we have decided to purchase it. Best of all, the after-sales support was, I must say, the most friendly, efficient and responsive we have come across among Magento extension companies so far. We have deployed the extension to production within days after integration and testing, and we are extremely happy with the results. It works so well on my site. Also they promised to add some features I asked for, they added them for my site and these functiosn are so perfect! This is one of the most useful extensions I bought! This Magento 2 One Step Checkout extension helps me solve a big problem with high abandoned cart rates. Many customers left immediately when they go to long checkout page before. Not it get better. Sales come back and I am very satisfied about it. It is better to upgrade some features for this extension but for me, it is enough! Gives much more user friendly and fast checkout than default Magento. This Magento 2 One Step Checkout extension is really amazing and useful. It is very eay to install and use, especially documents are detailed. I like your checkout page in only one step.. very quick and user friendly. Highly recommend to use for Magento stores! Your Magento 2 One Step Checkout is good but I think it is better to allow customers to edit cart. This can make your extension more perfect than ever! I love your support team: very fast and enthusiastic. I will wait for your updates! No need to worry about the long checkout process of Magento. This module help me to solve a big problem: very high abandoned cart rates at checkout. Almost customers is not happy with old step of checkout. They can not edit at one time. I love this One Step Checkout so much because It does not have many bugs. Support team is very professional and help me solve problems in the shortest time. I am reallay satisfied about this one. I think this is the best module for my site. Good! This module help improve my checkout so much. Customers is very happy with new checkout. It is better to improve it more and more. Reasonable price. Good module. Fast and professional support. Problems is solved in some hours. Highly recommend to use for all Magento 2 store! Fast checkout and good responsive! This plugin save much time for my customer. It checkout faster than default and I love responsive on mobile. Recommend to use for sites. I really like your module so much because its features are absolutely amazing. The checkout page becomes easier and I also get more orders from I install this one. Excellent extension! Worth every penny. This is an extension for Magento 2 that totally satisfies my requirements for a faster checkout page to save shopping time for customers. The checkout page is very easy for my customers to complete information quickly. I especially love the feature of showing delivery dates and time in the Order detail from backend. It helps me so much to manage shipping for customers more effectively. Also love your great support! Good job!